Christmas for me is hardly Christmas without children “bouncing off the walls,” excited and joyous because Santa Claus has come. My little brothers would wake the family at 7 AM on Christmas morning to see what Santa had placed under the tree. I didn’t have much time to do my hair or makeup while they were imploring our parents to let them open their presents. The chaos of torn wrapping paper and discarded boxes, cries of delight and jubilation, parental approval, and good will commands my memory. I’m so blessed to have had a happy childhood, to have parents and brothers who loved and whom I love. It wasn’t that way for my husband Chris. There was no love in his house, no parents or brother to share the affection that Christmas generates in a home where love exists. His Christmases were lacking in gifts and harmony. Rather, they were occasions for rejection, indifference, and hostility. Instead of finding holiday comfort in the warmth of a loving family, Chris fled from his parents’ home, jumped in his car, and found solace driving on the narrow and deserted country roads leading to Fyne Court. The air was white with frost. It coated the earth in crisp ice crystals, a cold and glistening blanket covering the brown and dying earth. There was no one to disturb the silence of this holy morning. Chris pulled up to the closed gate at Fyne Court, parked his car at that very spot, and slipped inside. He was not a trespasser; the caretaker knew him well and knew he was trustworthy. Chris was a frequent visitor to this 18th century estate with its quiet pathways winding through the wood and over the stream. The caretaker knew that Chris found so much peace here that it was a special, almost sacred place to him. Certainly, to Chris, this was as much a church as he would ever want, a sanctuary from the world. It was Chris’ Christmas tradition to come here alone early in the morning, make himself tea, and walk the desolate nature trails. The caretaker left the tea room open, knowing that he would be there to take tea on Christmas Day. As Chris walked the lengthy pathway leading to the buildings on the old estate, he pulled the collar of his jacket up around his neck. The bitter cold had pushed the gravel up along the way. It glittered like diamonds against the frost-crusted ground and crunched beneath his feet. The only human sound was his. The other sounds were nature’s own: the breath of wind through the barren trees and brush, the snap of falling twigs and withered leaves. Chris had a bag of crisps and biscuits in his hand. He broke the silence to call for his friend. “Bob” the Robin came at his call. His feathers puffed up against the cold, he followed Chris along the path, leaving his tiny footprints in the frost. He didn’t stop outside the tea room. He followed Chris inside when he opened the door. Chris was a fixture at Fyne Court. He had his own teapot and teacup there, which were carefully stored away for his use. He took them out of the cupboard, put on the kettle, found a teabag, and spooned out the sugar and creamer while the Robin watched him expectantly. 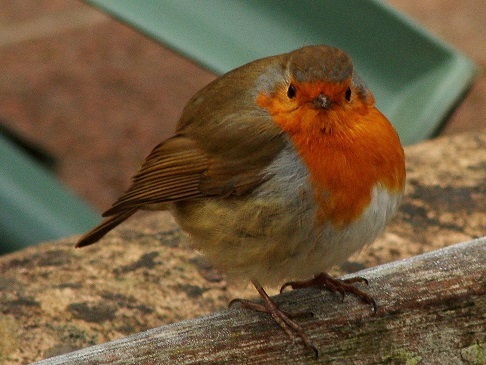 A cheeky little fellow, the Robin was especially bold now that winter had frozen the earth. He was cold and hungry, but he seemed to know that Chris would do him no harm, but might do him some good. As carefully as possible so as not to frighten him, Chris opened his bag of snacks and crumbled the crisps and biscuits on the table. The tea was now cooling in the cup on the other side of the table. 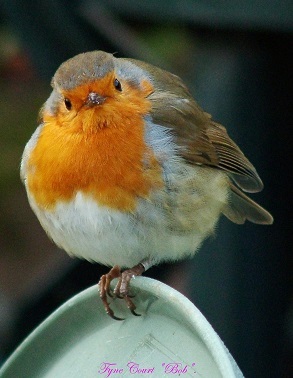 Chris sat and waited, not moving, hardly daring to breathe in expectation of what the Robin might do. Slowly, timidly, the bird alighted on the table and approached the crumbled pile of goodies. Soon, he delicately pecked away at the crumbs. If Chris was patient, he might see the Robin perch on the rim of his teacup and take a sip. Robin and human shared a Christmas moment, a sublime instant of communion. The English Robin is a symbol of Christmas. The Legend is that the Robin kept Baby Jesus warm by flapping his wings by the fire, even after an ember burst from the flames and burnt his breast. 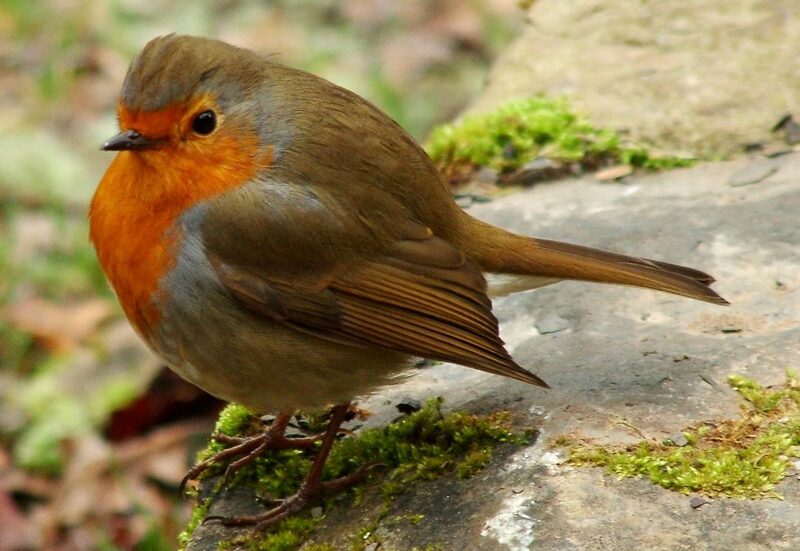 The rosy breast of the English Robin is an eternal reminder of his self-sacrifice and kindness to the infant Child. Who could find a better companion on a cold and barren Christmas morning? Do You Believe In Spirit of Place? PamelaH on Why Haven’t You Written?